Bathrooms play an incredibly important role in homes today, understandably so when one considers the time that you spend in your bathroom each day. The dedicated and talented staff at B² Design Build recognize that bathrooms should be designed to be much more than just a functional room in your home. We are a professionally licensed home renovation company that offers updates and complete renovations for bathrooms. We believe the possibilities for bathroom remodels are endless, no matter the amount of space or budget that you’re working with. We can create bathroom remodels that reflect the needs of our clients and provide luxury, efficiency and uniquely customized spaces with superior craftsmanship. 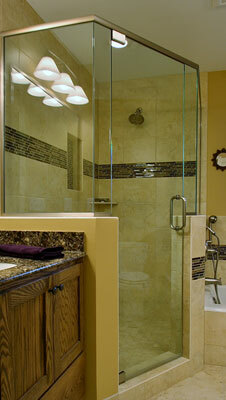 Bathrooms can easily be remodeled to be an area that provides comfort in addition to serving everyday purposes. We can help you create a place where you can soak away stresses while taking hot baths or begin your days underneath gorgeous rainfall shower heads. From the very beginning to the stunning finish of your bathroom remodel, we work with you to assure that the renovation process is as seamless as possible. We always follow the budget and timeline created for you and are proud to deliver outstanding workmanship and functionality to each client that we serve. Let the experts at B² Design Build help you make your bathroom remodel a dazzling transformation to your home. Our attention to detail and unmatched customer service are components place us far above our competition. Contact our bathroom remodeling experts today at 651-333-9394 or via email at info@b2designbuild.com to begin the process of creating an inspired bathroom remodel today.